You are currently browsing the tag archive for the ‘Operation Safe Babies’ tag. Since launching our Operation Safe Babies program last year, we’ve provided safe, portable cribs to more than 325 parents across Northern Virginia. We’ve also answered hundreds of their questions about how to make sleep safe for their babies. Q: Why should I put my baby on her back to sleep? 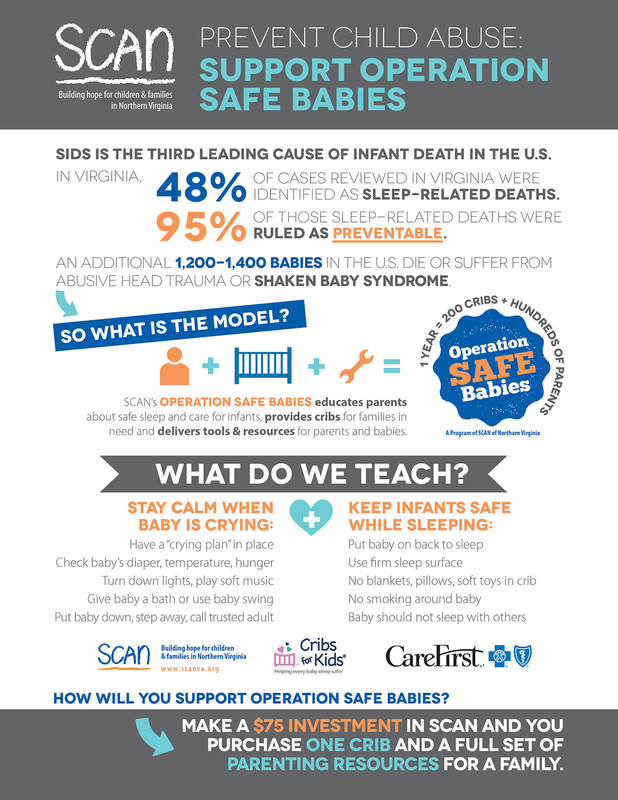 A: (From the NIH Safe to Sleep Campaign) Research shows that the back sleep position is the safest for babies. The back sleep position carries the lowest risk of SIDS. Research also shows that babies who sleep on their backs are less likely to get fevers, stuffy noses, and ear infections. The back sleep position makes it easier for babies to look around the room and to move their arms and legs. Remember: Babies sleep safest on their backs, and every sleep time counts! EXTRA TOOL: Check out the NIH FAQs list for more great answers. Q: I’ve heard co-sleeping can be good for my fussy baby. Is it safe? A: (From Cribs for Kids) The act of bringing an infant into a sleep environment with adults, other children, or pets puts the baby in danger of suffocating, either by being smothered in bedding; by positional asphyxia, which occurs when a baby’s position prevents them person from breathing adequately; or by being accidentally rolled over by a sleeping companion (overlay). To the editor: The risks of sharing your bed with your infant are not “imaginary,” contrary to the opinion expressed by Robert LeVine and Sarah LeVine. An adult bed poses very real risks of sudden infant death syndrome (SIDS), unintentional suffocation, strangulation or entrapment to an infant. Sleep-related infant deaths claim more babies between 1 month and 1 year of age than any other cause. Multiple studies bear this out. That’s why the American Academy of Pediatrics advises against bed-sharing. The safest place for an infant to sleep is in a separate crib or bassinet with a tight-fitting sheet and nothing else, preferably in the parents’ bedroom for up to a year. Benard Dreyer, MD, Elk Grove Village, Ill.
Q: How can I make sure other caregivers are careful when putting my baby to sleep? A: SCAN developed a “Pledge Card” in English and Spanish. We encourage parents to make copies for babysitters, family members and other caregivers to sign and hang up as a reminder for the children in their care. Q: What does a “safe sleep” environment look like? A: The National Institutes of Health has a great online visual tool that allows parents to see and interact with pictures of a bedroom as they learn how to create a safe sleep environment in their own home. What questions have parents asked you about safe sleep? We’d love to help you answer more questions! A report recently published in Pediatrics and funded by the National Institutes of Health spotlights a troubling statistic: 20 percent of new moms said they did not receive advice from their doctors regarding current recommendations on issues like safe sleep and breastfeeding. This reflects a greater challenge we’ve noted in our community — new parents often feel isolated, in need of resources and hungry for connections that can make them more nurturing parents. 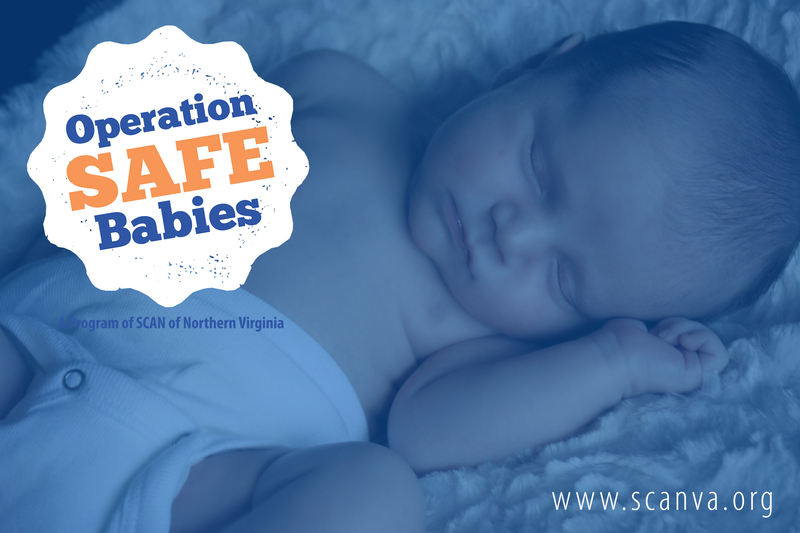 Our new Operation Safe Babies initiative is one way SCAN is working to address the issue in Northern Virginia. Most of our readers know that SCAN has three core programs: CASA, Parent Education and Public Education. From abused children already in the system to new parents bringing home a baby to families reunifying after immigration, our programs reach children and families living very different realities. These programs are complex and well-developed and effective. But they’re not always easy to explain. Over the past year, we’ve developed infographics to help us (and help YOU help us) tell the story of our programs and how they impact prevention in our community. 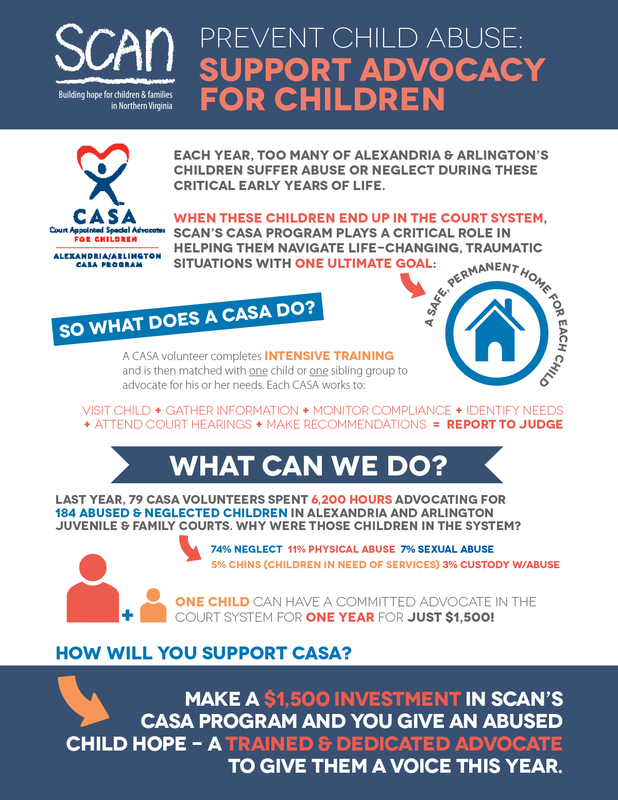 We hope you’ll share this post with others when you talk about SCAN and consider the impact of our prevention programs! We say it over and over: Parenting can be tough. From the first day a child comes home from the hospital, parents face decisions and schedules and subjects they most likely have never even thought about before. It’s a time when parents — especially those in high-risk families with few community connections — need all of the support they can get. That’s where Operation Safe Babies comes in. With support from CareFirst and through a partnership with Cribs for Kids, SCAN’s newest program will focus on educating parents about safe sleep for infants, providing cribs for families in need and delivering resources for families in Northern Virginia. This month our Public Education Manager Tracy Leonard met with teen parents at TC Williams High School and will gather over 20 service providers together at Inova Fairfax Hospital to pilot the training program. In the coming months, SCAN will provide 200 infants in our community with safe cribs. We’ll work with community partner organizations to provide parents of infants with specially developed educational materials and resources on Safe Sleep and Abusive Head Trauma. We will start, again and again, at the beginning of hundreds of children’s lives. As prevention advocates, we can think of no better place to be. If you are interested in hosting a training or learning more about the program, please contact Public Education Manager Tracy Leonard at 703-820-9001 or tleonard@scanva.org.